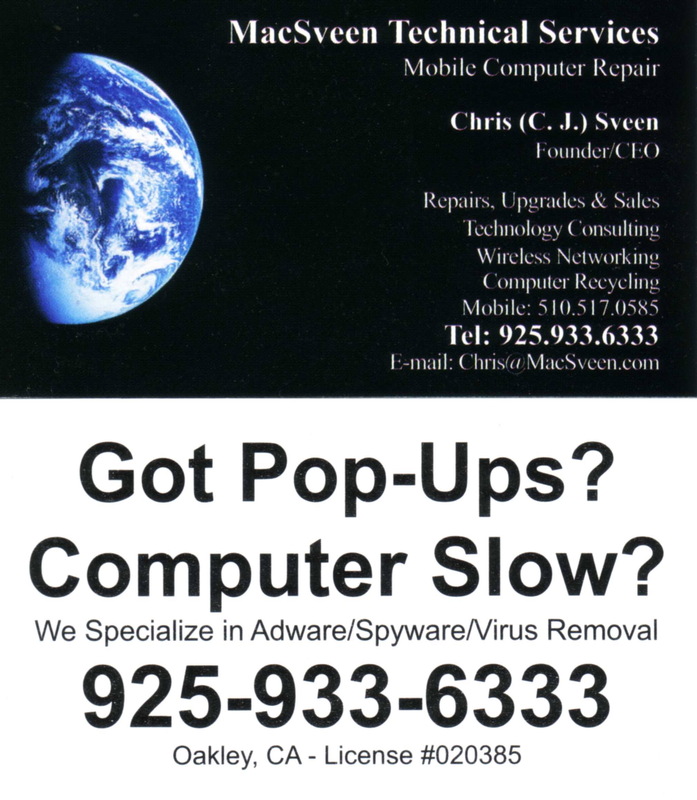 MacSveen Technical Services is a mobile computer repair service. We come to you at your convenience. MSTS services the areas of Oakley, Brentwood, Byron, Discovery Bay, Bethel Island, Knightsen, Antioch, Pittsburg and beyond. We specialize in the removal of adware, spyware, malware, viruses and other unproductive software. MSTS also performs hardware repairs, upgrades and sales. Whether you need help with a PC or an Apple/Mac, MSTS can provide consulting, setup, custom built systems, wired and wireless networking solutions, data backup and recovery, system restoration and electronic recycling.